It is said that all roads lead to La Bottegas, our sunny Italy in the very heart of Prague. Just a short walk from Old Town Square, you can escape into thoughts of Italy and enjoy the delicious cuisine of La Bottega di Finestra. Only the finest Italian ingredients go into our new menu for you to enjoy throughout the summer. For our soups, we offer a really strong beef consommé with ricotta gnocchi or cannelini bean soup with clams and parsley oil. 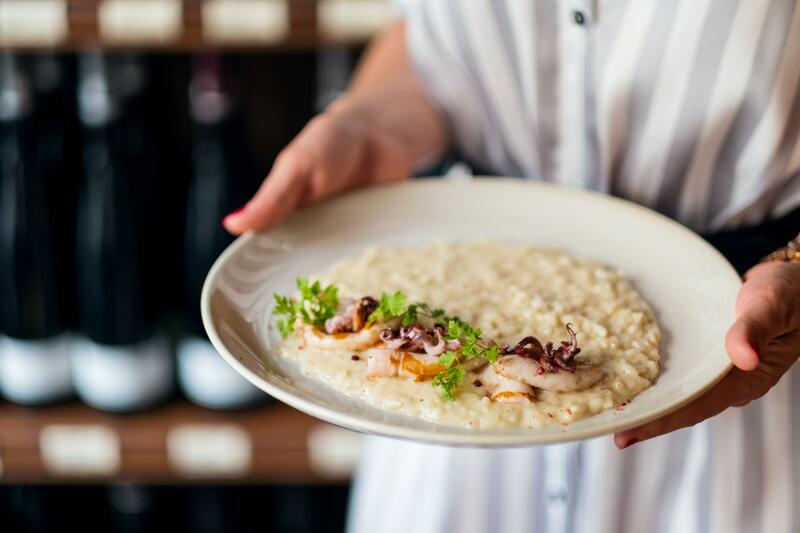 Come and visit us for a delicious light lunch, risotto cacio e pepe and smoked squid or potato gnocchi with pulled veal and pickled onions. What would a trip to Italy be without homemade pasta? We produce fresh pasta for all of our La Bottegas. Come taste our ravioli filled with porcini and pecorino with baked garlic purée and shallot sauce or rigatoni with fresh tomato sauce, basil and stracciatella cheese. Another sure bet is rolled rabbit leg with kidneys, pancetta, turnip and spinach purée. This is a tip from the chef Lukáš Pocnar. The range of our main courses includes Scottish salmon with garden pea-​ginger purée and tomato concassé. The latest innovation from out kitchen is the beef burger with truffle mayonnaise, portobello, pak choi, smoked scamorza and Coleslaw salad. Don’t forget to pack a bit of Italy home with you during your visit. In the back of the shop, we have carefully selected Italian products, fresh fish and seafood daily, aged meat, crispy bread, ripened cheeses and the sweetest desserts. Whether you are out for a business lunch, a meeting with friends, a date, or just a coffee, La Bottega di Finestra welcomes you with the best that Italy has to offer. Book your table online, email: lafinestra@labottega.cz or call us on +420 222 233 094.